Is your roof protecting your home the way it should. 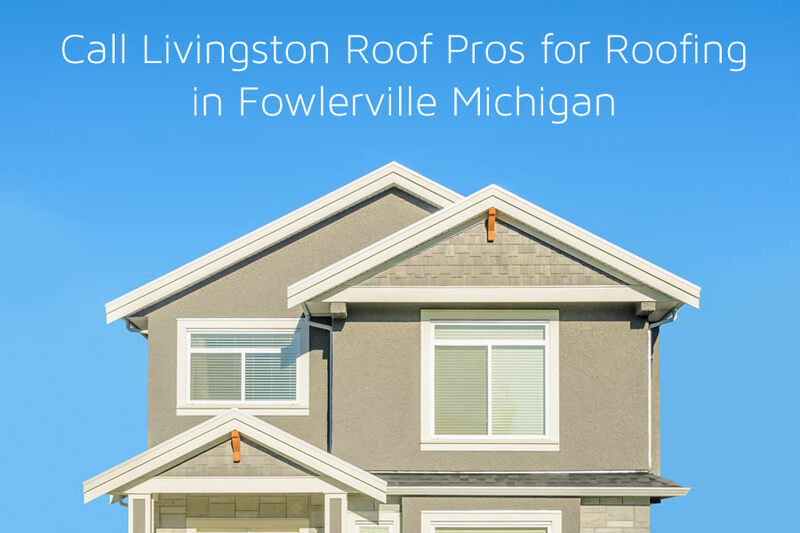 If you’ve noticed problems with your roof or you have a roof leak and you’re located in the Fowlerville Michigan area be sure to call Livingston Roof Pros. A top rated roofing contractor in Fowlerville MI, Livingston Roof Pros can repair or replace your roof and offer warranties on that work and materials. Be sure to check out this article for more information roofing Fowlerville MI or give us a call today to talk with one of our roofing specialists. When you need roof repair and replacement in Fowlerville Michigan calling Livingston Roof Pros should be your first choice. We offer all sorts of services to help protect your home’s roof and your family inside. Although we are a roofing company and the majority of our work is done to roofing there are other areas where we also provide service and repair. The following services are offered by Livingston Roof Pros. If your roof needs a repair Livingston Roof Pros can help. Our experienced roofers can inspect and repair roofs. We have extensive experience in all sorts of roofing systems including: asphalt and fiberglass shingles, metal roofing, roll roofing, and more. If your roof is leaking and you live in the Fowlerville Michigan area be sure to contact Livingston Roof Pros today. Is your roof aging and you need a new roof installed? At Livingston Roof Pros we can fully install a new roof using the latest roofing systems to keep your home protected for decades. The materials available for roofing today can have a warranty that lasts 50 years or more. Talk to one of our roofing specialists today to learn more about the warranty we offer both on labor and materials installed. We can completely remove the old roof with a tear off installation. We completely remove any shingles and tar paper from the original roof. This allows us to take a closer look at the sheeting on your roof and repair or replace any damaged areas. Once we have all the old roofing material removed we’ll then install the new roof and clean up any debris or old roofing materials that were removed. If you’re looking for a less expensive way to get a new roof we also offer re-roofing service in Fowlerville Michigan. Instead of removing the old roofing material we’ll simply place the new roof over the old one. This allows the home owner to save some money although there are some drawbacks to using re-roofing which we outline on our website. Keeping your roof in good shape means you’ll need to take care of it and get an annual inspection. An annual inspection can help you locate small problems in the roof and take steps to repair them before they become a huge problem. At Livingston Roof Pros we offer a free roof inspection to locate any of these small problems and help you get them fixed before they cause a catastrophe. We can regularly offer maintenance to your roof whether you’re a residential customer or a commercial customer because we offer both residential and commercial roofing service in Fowlerville Michigan. Lately there has been a big increase in the number of customers who choose metal roofing over traditional asphalt shingle roofs. At Livingston Roof Pros we can install and repair metal roofing for your home. Metal roofing comes in a variety of colors and the prices of metal roofing have come down over the last few years which is why many home owners are now choosing metal roofing. If you’re ready to install metal roofing on your Fowlerville Michigan home be sure to contact Livingston Roof Pros today.